We were close to achieving our goal of Torres del Paine by the end of February. What is it they say about best laid plans? The plan was to hang out in Bariloche for two weeks and then make our way south to Patagonia. We are technically in Patagonia now, but the “real” Patagonia is further south. Our plan was to travel to El Chalten to see Fitz Roy (most everyone goes there), then to El Calafate (most everyone also goes there), and then to Torres del Paine to do the pinnacle of multi-day hikes, the “O” circuit (EVERYONE goes there!). This trip is about a lot of things. We want to see amazing landscapes, visit historically significant places, meet inspirational people, and simply experience what we experience where we are in that moment in time. In essence – just be. This trip isn’t necessarily about “bucket-list” items. But, there are definitely things we know we want to see and do. Plus, we meet people every day and ask them where they’ve been and where they’re going as a way to help us figure out our next steps. 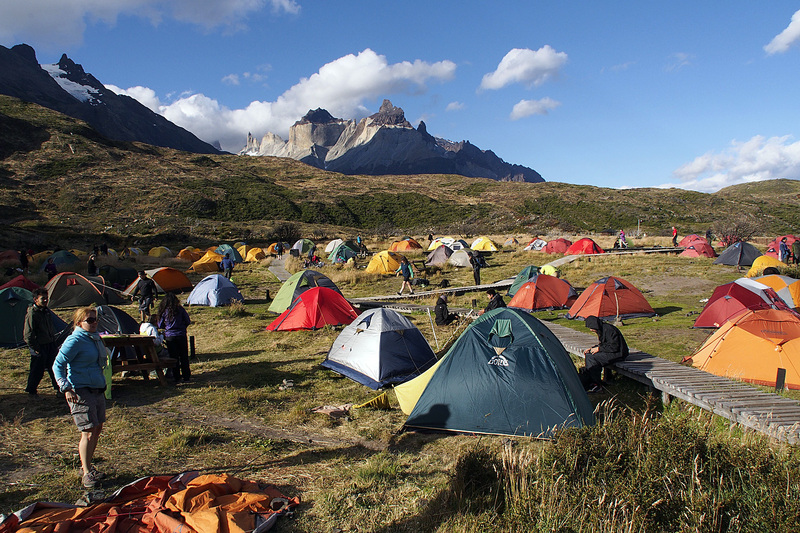 One of the places on our list has always been Torres del Paine. It was our goal to get there by the end of February, the end of Argentina’s summer. We wanted to hike the infamous “O” trek before the snow and cold. However, after the Salkantay hike, we, well specifically I, have been questioning whether we were up for another multi-day trek. Particularly this one, which would be about 9 days. Everyone we meet here in Bariloche is either on their way to Torres or just returning from Torres. They all have stories of their epic hike or have bundles of anticipation for the scenic hike and once-in-a-lifetime trek. Terry’s words really made us think. Just what was motivating us to continue south? The feeling that we have to do Torres because everyone else does? That was definitely part of it. Also, I truly did want to experience it and share it with Cory. This would be Cory’s second time to Torres. He completed the “O” circuit 13 years ago, when Torres was not the attraction that it is today. Things have definitely changed since then. Two Canadiens who recently completed the trek reported that each campsite is decked out with a store where you can buy beer, wine and food and where you can rent camping equipment. You also need to reserve and pay for the campsites. A blog from 2014 reported seeing 150 tents at the camp, a sight that “looked like someone had scattered a bag of M&Ms” in the meadow. This definitely doesn’t sound like wilderness. And compared to what we’ve done so far, we were not excited to hike Torres with hundreds of others. There are a lot of other issues here about overuse and preservation, both of which I’m sure camping fees benefit. But, Terry’s point is a good one. Are we obligated to complete the Torres trek because hoards of people flock there in the summer to do the same? We struggled for over a week trying to decide our next move. The sticker shock of the bus fares and plane tickets was overwhelming. Everything here is more expensive and Cory is getting worried about money. We were even contemplating hitchhiking our way to the end of the world… But, then we realized that neither of us were motivated to continue south. I was not looking forward to a 9-day trek in the cold wind and rain…summer here is quickly disappearing. All of this weighed on us. And today we finally made a decision. We realized that visiting Patagonia is not a once-in-a-lifetime opportunity for us. We can always come back, even later this year. We realized we are on our own time table. We can dictate our own agenda. And if we don’t feel like trekking now, we don’t have to. So, we leave tomorrow on a bus to Buenos Aires where we found a beautiful airbnb to spend a week and explore. Instead of fighting crowds in Torres, we will head north, continue on with our travels, volunteer through November and then come back at the very beginning of the season when the people will be few and the weather more predictable – hopefully. Torres de Paine still calls us. Now we can focus on new opportunities, like volunteering with an organization to save sea turtles in Uruguay, working on a winery in Mendoza, dog-sitting in Chile, helping with a sustainable farm in the cloud forest, and managing a private beach community on the coast of Ecuador. But when summer turns to fall in the northern hemisphere, and winter turns to spring here on the other side of the world, we will likely hop on a plane to the bottom of the world and finally trek Torres del Paine. Torres del Paine will be busy but it is a beautiful place. However, you will not have much of a “wilderness” experience. Fitzroy is probably a better place for that. Although busy as well, not nearly the zoo that TdP can be. And it’s expensive as the Chilean parks system is milking it for every penny it can. When a visit becomes a burden it is time to move on. Based on your description you made a good choice. Enjoy Buenos Aires and keep the blog rolling.